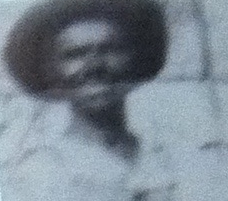 Started From the Bottom | Rider Fields is My 4x Great Grandfather - who is nicka smith? Sarah Vann Rogers, wife of US Deputy Marshal Issac Rogers, died at age 24 in 1884 leaving behind two sons under the age of six. Both her sons would meet a similar fate dying before seeing age 40. Thank God my paternal grandmother, Sarah’s granddaughter, lived to see age 79. In earlier posts, here and here, I wrote about discovering my link to the Cherokee Nation and the implications of that discovery. I knew then that I was in for a wild ride of more discoveries, but I don’t think I was quite prepared for the pop and lock that my ancestors did out of the grave like the Thriller video. Theodore Cooey Vann Rogers, born January 10, 1883, died between 1920-1925. 1901 – Dawes Applications, Cherokee Freedmen – Nelson Vann Rogers F853 (1), Theodore Cooey Vann Rogers F854 (1) – Both my 1x great grandfather, Cooey, and his brother Nelson’s Dawes packets (as per their own testimony) list their parents as Isaac Rogers and Sarah/Sallie Vann. They both confirm that Sarah died when they were both young, and that Sarah and Nelson were on the 1880 Cherokee Census. Civil War Pension File – Isaac Rogers, USCT 79th Regiment, Company E; First Kansas Infantry, Deposition by Columbus McNair, July 30, 1897. Source: National Archives and Records Administration. 1880 Cherokee Census, page 161, number 2361, Sallie Vann Rogers, age 20, colored, female. Source: National Archives and Records Administration, Microfilm P2072. 1880 Cherokee Census – Sarah Vann Rogers and Nelson Vann Rogers (3) – A visit to the National Archives San Francisco yielded a census before Sarah passed away. As noted in the Dawes packets above, both Sarah and Nelson were listed. One would assume that Ike would be with his wife and child, but he wasn’t there. (After some further Dawes packet research, I found that Ike had another child around this time named Eddie Rogers (R479); it’s possible Ike and Sarah were separated). Sarah, documented as Sallie, also had the word “DEAD” stamped next to her, while Nelson’s Dawes card number “F 853” is noted beside his name. These notations were made well after the 1880 Cherokee Census took place and were likely done by folks working on behalf of the Dawes Commission. Here’s where I hit a dead end. I searched newspapers and many other documents for more on Sarah, but nada. Zilch. This is when I got the idea to search for Sarah and her family in southeastern Kansas. I knew that Sarah’s husband Ike, his family, and many other Cherokee freedmen migrated into Southeast Kansas before and during the Civil War and stayed for a bit afterward, so I decided to see if I could find someone fitting Sarah’s and her sister Ruth’s description on one of the Kansas State Census’. These state census’ are valuable because they happened on the 5’s (ie. 1865, 1875, 1885, etc.) instead of the 10’s (ie. 1870, 1880, 1890, etc.). 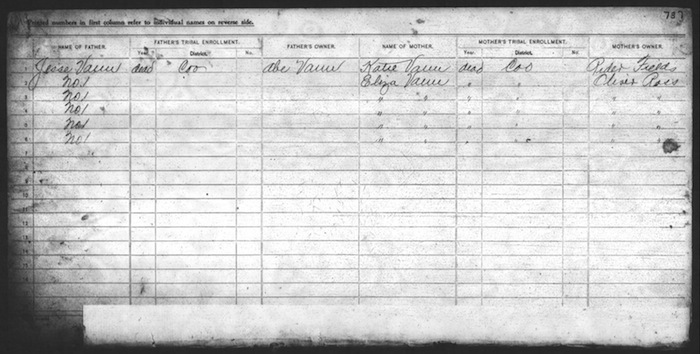 Kansas State Census – 1865 – Sallie Vann (5) – Boom. I found something looking in the exact same county in Kansas that Sarah’s in laws were living in from 1861-1880. Not only was there a Sallie Vann, but there was also a Ruth (both born in the Cherokee Nation with ages that matched my Sallie and Ruth), but they were in a household with a man and woman who appeared to be their parents, Jesse Vann, a farmer, and Kate Vann, a housewife, along with brothers and sisters, Julia, Benjamin, William, Irvin, and Jesse Jr. I then remembered something. I recalled seeing some Vanns with Dawes Commission Cards issued right before my 1x great grandfather Cooey (F854), his brother, Nelson (F853), and his stepmother, Sarah Fry Rogers Whitmire (F852). A Ben Vann (F851) and Dunk Vann (F850) appeared to be related when I first found the cards for the folks I knew, but I wasn’t sure at the time. 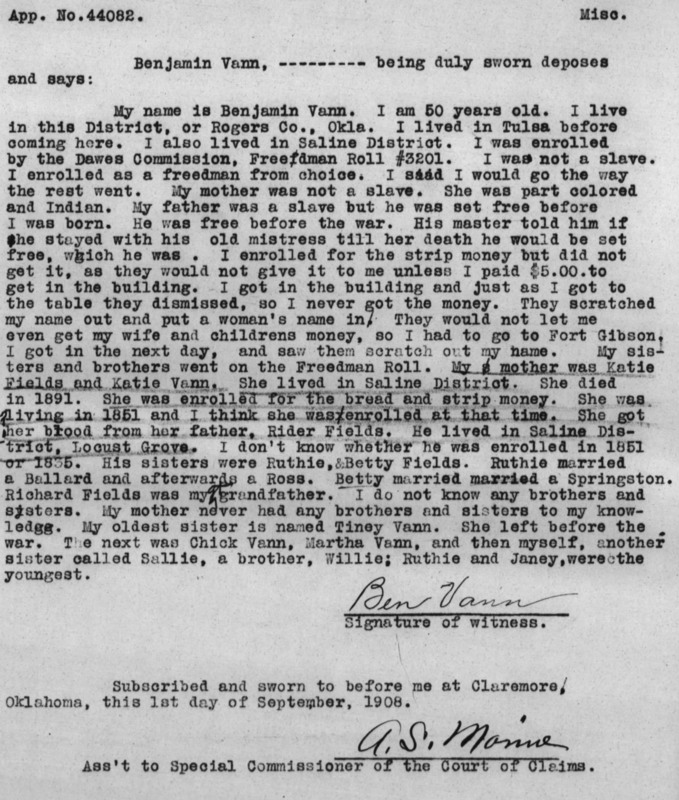 Dawes Card and Application, Cherokee Freedmen – Ben Vann F737 (7) – I figured that Jesse and Kate didn’t live long enough to see the Dawes Commission, so I looked for their oldest son Benjamin. There were a few Ben Vann’s listed in the freedmen cards, but I confirmed that F737 was Jesse and Kate’s son since they were listed as his parents on the back. As I suspected, they were dead by 1901. Jesse’s former slaveholder was Ave Vann or Avery Vann and Katie’s was Rider Fields. On the front of Ben’s card, I noticed he had a son named “Cooley” which is what my 1x great grandfather is sometimes listed as on records. After a clue from Bernice Alexander Bennett, I decided to check the Eastern Cherokee applications to see if any of my ancestors were in those. Boy, did I hit the jackpot. 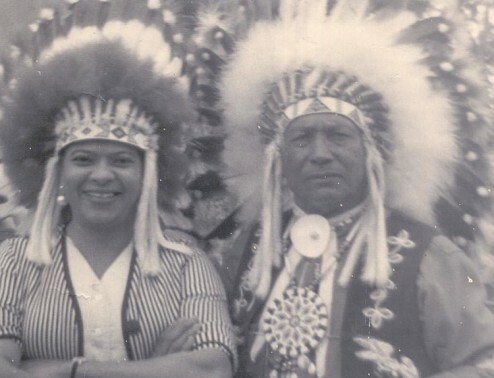 Eastern Cherokee Application – Ben Vann (44082) (8) – Ben submitted an Eastern Cherokee application and stated that not only was Rider Fields his mother’s slaveholder, but that he was also her father!!!! I double checked what Ben stated with my DNA test results on both 23andMe and AncestryDNA and I had several genetic cousins that were tied to this exact family of Fields! Using this information, I’ve been able to find significant documentation online that goes back to Ludovic Grant, who was a Scotch rebel who was banished to Charles Town, SC (Charleston, SC) and eventually became a trader with the Cherokee and married a Cherokee woman. 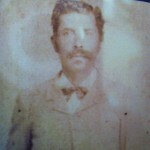 Ludovic Grant is my 8x great grandfather through Rider Fields. This story is developing, but it’s definitely my first, real connection that I’ve been able to make using traditional genealogy, oral history, and DNA. (1) Applications for Enrollment of the Commission to the Five Civilized Tribes, 1898-1914, Nelson Vann Rogers, Cherokee Freedmem F853, Cooey Vann Rogers, F854. Source: http://www.fold3.com. Accessed February 1, 2014. (2) United States Civil War Pension File, Isaac Rogers, US Colored Troops, 79th Regiment, Company E; First Kansas Infantry, Date of Filing: August 18, 1890, Class: Invalid, Application Number: 882.523, Certificate Number: 712.932, State from Which Filed: Indian Territory; Date of Filing: July 3, 1897, Class: Widow, Application Number: 657.980, Certificate Number: 460.080, State from Which Filed: Indian Territory; Date of Filing: October 27, 1900, Class: Minor, Application Number: 729.487, Certificate Number: 510.872, State from Which Filed: Indian Territory. Deposition by Columbus McNair, July 30, 1897. Source: National Archives and Records Administration. 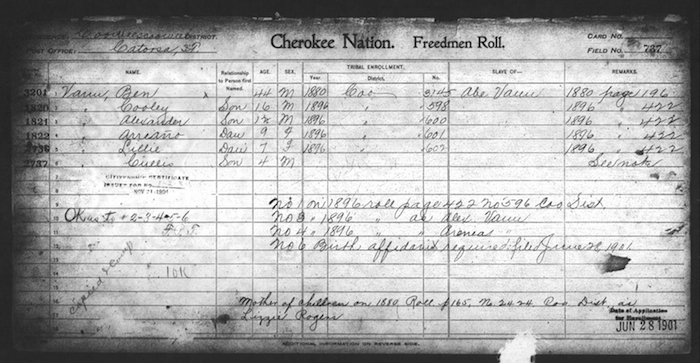 (3) Cherokee Census, 1880. Page 161, number 2361, Sallie Vann Rogers, age 20, colored, female. Source: National Archives and Records Administration, Microfilm P2072. Source: National Archives and Records Administration. (4) Oklahoma Historical Society. “FREEDMEN.” Encyclopedia of Oklahoma History and Culture. Oklahoma Historical Society, n.d. Web. 01 Feb. 2014. <http://digital.library.okstate.edu/encyclopedia/entries/f/fr016.html>. (5) Ancestry.com. Kansas State Census Collection, 1855-1925[database on-line]. Provo, UT, USA: Ancestry.com Operations Inc, 2009. Osawatomie, Miami, Kansas, Line 24, Sallie Vann, age 5, child of Jesse and Kate Vann, born in the Cherokee Nation. Accessed February 1, 2014. (6) Applications for Enrollment of the Commission to the Five Civilized Tribes, 1898-1914,George Rider, Cherokee Freedmen F1563, Page 13. Source: http://www.fold3.com. Accessed February 1, 2014. (7) Enrollment Cards for the Five Civilized Tribes, 1898-1914, Ben Vann, Cherokee Freedmen F737. Source: http://www.fold3.com. Accessed February 1, 2014. Applications for Enrollment of the Commission to the Five Civilized Tribes, 1898-1914, Ben Vann, Cherokee Freedmen F737, Page 13. Source: http://www.fold3.com. Accessed February 1, 2014. (8) Eastern Cherokee Applications of the U.S. Court of Claims, 1906-1909, Ben Vann, 44082. Source: http://www.fold3.com. Accessed February 1, 2014. I’m looking for information on a daughter of Rider Fields. Ellen Fields could you possibly point me in a direction? Emmett Star lists her as deceased in his book History of the Cherokee. Wondering where that info came from. Pingback: There’s No Wizardry or Voodoo in Tracing Slaveholders – who is nicka smith?